This is a quick post for all my Boston ABDL readers. The Boston Littles Munch for the month of May is coming up soon! The next munch will be Monday night May 2nd at 7pm at Bertucci's in Alewife T Station in Cambridge, MA. I'll be there and I hope to see some new people as well. Please email our coordinator angeltigriss@yahoo.com to RSVP and check out this link for more information. I feel like a bad blog owner. My last post here was on April 8th, and although I’ve met my average posts per month (5), I feel like I’ve been neglecting my readers. I have spent my absence in part on working out how I can improve this blog. I have been outlining new topics for discussion, I created a mobile version for all my mobile viewers, and the biggest change so far is my new URL. 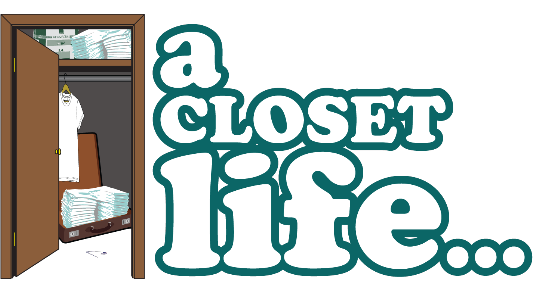 You can now all find me at www.aclosetlife.com. I am proud to finally have a .com to call my own and I hope this proves to you all where my commitment level is. I will be hammering out a posting schedule soon so stay tuned because there’s much more content on the way! 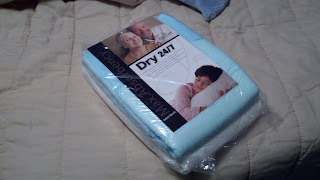 What I'm going to do now is a review of the Dry 24/7 diapers. I will start by saying my normal diaper of choice is the Bambino Bianco so any comparisons I will be making are between the Dry 24/7 and Bambino Bianco. I am not a fan of a rating system because if I give a diaper a 5 vs a 4, what does that tell you? I think a written review will give you a much better sense of what the diaper can do and what you can expect when wearing it. Upon first inspection of the sample 2 pack, 1 small and 1 medium, I'm not sure what exactly I received. I did get two diapers, one white and one light blue just as the website says, but they both say medium on their undersides. The light blue diaper is supposed to be the small and it is slightly shorter, as you can see in the below image, but when I put it up next to a medium Bambino Bianco, the light blue 24/7 is actually wider in the crotch. 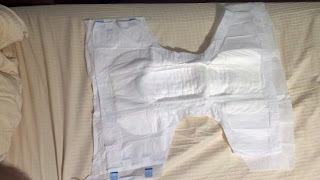 When I put a medium Bianco on top of the 24/7, as you can see in the below image, the Bianco is about the same width in the crotch but the 24/7 is wider in the tape area, both front and back, and it is an inch or so longer. The 24/7 feels thicker and stiffer then the Bianco. It isn't quite as soft but since it's thicker it feels squishier and more comfortable when you sit down on a hard surface. It also feels like a stronger plastic then the Bianco, but it doesn't have a tape landing zone which I really miss. There are 2 tapes on each side as you can see in the above picture, and they are of the adjustable variety, which I am not a big fan of. I would rather have a tape landing zone so I can adjust the diaper over and over again all OCD like. Immediately upon taping this diaper on it is apparent that it's a bigger diaper then the Bianco. It sits much higher in both my back and front which makes me feel almost lost in the diaper, but you may like this if you're an AB. It also feels thicker between my legs which could be explained by the stiffer padding not bending as much and giving the impression of a much thicker diaper, but I'm not complaining. I spent a couple hours in this diaper before I started wetting it and I can say that it is rather comfortable all around. Soon after I started wetting I got the impression that these diapers will hold a lot! It should be noted that I was pointing up for this test, as I usually do. The diaper does swell very generously which can also be its crutch. It swelled so much while I was writing this that it pulled the leak guards away from my skin which will undoubtedly lead to minor leaking. The diaper did get to a point where I couldn't even close my legs anymore and it still hadn't leaked! I wouldn't be able to do this with the Bianco without a stuffer. Of course the issue with wearing a sagging diaper is that my bottom right tape failed so I peeled off the blue part and stuck it back on, problem solved. The Dry 24/7 is all around a good diaper. It holds a ton and swells up generously, much more then the Bambino Bianco. If you enjoy thick diapers, the 24/7 will swell so much you won't be able to close your legs anymore, but if you're sitting down that could cause it to leak. I am definitely not a fan of the lack of tape landing zone or the adjustable tapes that replaced it. The unfortunate thing about the Dry 24/7 is that I noticed a considerable amount of sweating. Sweating, if you are unaware, is the urine inside the diaper leaking through the outer cover. Normally I would chock this up to a defective diaper, but I have heard many people mention this recently leading me to believe it's a much bigger problem. One final thing I would like to say is that if I was incontinent I wouldn't choose these diapers for myself. They do hold a ton but they also puff up a ton as well, making them very noticeable under clothes. If you say just change more often, then I would would say that at roughly $2.39USD per diaper, you are wasting your money. These are great diapers, and when they fix the sweating issue I would consider these for a play diaper, but for now I'm going to stick with the Bambino Biancos. So I want to start off by saying the Boston Littles Munch was awesome! I was so nervous going into this experience but, as usual, there was nothing to fear. If you read my last post leading up to the munch then you know that I ended up doing way more driving then I wanted, but it was worth it. I arrived at the munch about 15 minutes early, I blame my parents for raising me to always be early, and decided to go to the ATM to get some cash. I walked over to the ATM, which was behind a locked door, and I stuck my ATM card into the slot to unlock the door and, nothing. I pulled the door handle a couple times and still nothing. At this point I started to panic a bit as a woman came up behind me. She noticed my frustration and offered to help. She practically pushed me aside, in a typical Boston way, and tried to stick her card into the slot, where mine was, and proceeded to push it further in to an almost unreachable depth. When she noticed what was really going on she apologized, wished me good luck and left. I immediately went to find the nearest person of authority, who ended up being a cop, and asked him to give me a hand. He told me he might have something to help and I went back to the door. As I was standing there waiting for the cop, I noticed a small washer on the ground. "Sweet!" I thought to myself. I picked up the washer and was able to pry my ATM card out of the slot. I motioned to the cop that I got it and went over to the restaurant. I was actually more nervous at home thinking about this night then I was when I walked into the restaurant. I walked up to the hostess and said I was part of a big group at 7pm. They said they had a few groups there that night and asked me if I knew the one person sitting alone at the table. Quickly I made up the excuse that I didn't know everyone who was going tonight and he said I could go ask if he was in my group. Now in high school I never would have done that; I was way to nervous to ever approach someone I didn't know, especially about such a sensitive subject. So I walked over and asked him if he was part of the much and he said yes. We sat and talked for about ten minutes before everyone else showed up and the festivities started. I say this in the kindest way, but that was one unique bunch of people. They were all extremely nice and very welcoming. I did feel a bit left out at times since they all have known each other for months or years, but that's to be expected. When all was said and done, I left there with a sense of acceptance. I felt like I belonged with this group and that they accepted me for who I am. I have never felt 100% accepted before and it's something I never thought I would feel. If you have never been to a munch before please look them up. Find a munch near you and just go, you will not regret it! For me, this was not only the first much I ever attended, but it was also the first time I even met a fellow fetishist in person. When I got home my wife said I looked happy and I owe that to the those people I met last night. Hanging out with like minded people, if even for two short hours, was a great experience that I didn't want to end. But all good things musty come to an end, so until next time! I will start off by saying that this will be a compound post today. I will start off with a brief paragraph now and I will post the rest tomorrow. So, as I'm sure you have already noticed, I have a logo! It was designed and redesigned and redesigned (sorry about that) by a good friend of mine Lazy Tiger from my hometown of Boston, MA. It may say Rhode Island on my profile but I was born and raised just south of Boston and I'm a mass-hole through and through! So please go visit Lazy Tiger's twitter page and hit him up if you need any graphic design work done, that's an order!